Fuji Electric Corp. of America is pleased to announce the launch of our new High Capacity Uninterruptible Power Supply System to the US market. The 7400WX-T3U is designed for data centers in all industries, and is available now for shipment. Fuji Electric has developed the high-capacity 7400WX-T3U for very large, hyperscale and enterprise critical power applications. 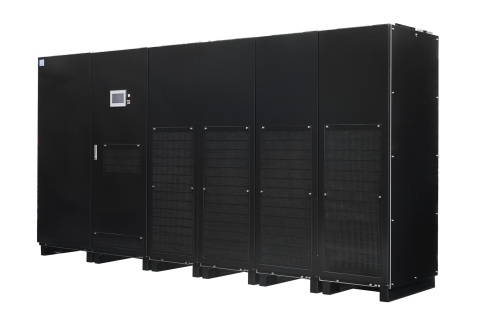 It is available in a myriad of sizes up to 1000 kVA, is parallelable up to 8 MVA, and has the highest efficiency rating in the industry in its size range. It features a modular design with true inter-module and system-wide redundancy, adding to its reliability and making it ultra flexible to suit every critical system design. "The new 7400WX-T3U is the most recent product that continues Fuji Electric's decades-long tradition in the development of groundbreaking innovations in UPS design", states Erik Monisera, UPS National Sales Manager. "A UPS should be efficient, easily maintained, flexible in designand above all reliable, and this new model has it all. The engineers at Fuji Electric have changed to the game once again." The unit is equipped with Fuji Electric's proprietary technology such as their hybrid-SiC power semiconductors and Reverse-Blocking IGBT (RB-IGBT), proven to add not only efficiency but durability. Its flat efficiency curve peaks at 97.2%, and its unique Module Control Management System allows paralleling between not only UPS inverter sections but those in paralleled units as well. Other features like its information-packed touch screen and versatile monitoring capability provide optimum visibility to end users. Learn more about the new 7400WX-T3U High Capacity UPS and about the complete line of UPS systems available from Fuji Electric. Fuji Electric Corp. of America is a wholly owned subsidiary of Fuji Electric Co., Ltd., headquartered in Tokyo, Japan and has been responsible for sales and distribution of the company's products since 1970. Fuji Electric Co., Ltd. began developing power electronics equipment in 1923, and is a global leader in industrial products ranging from semiconductors, HMIs, contactors, relays, and power generation equipment to AC drives and uninterruptible power supply systems. For more information, please visit https://americas.fujielectric.com/or follow us on LinkedIn and Twitter.